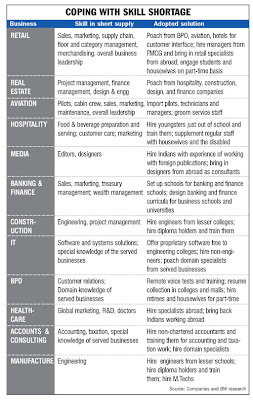 Options in India: Talent crunch-Corporate India forced to widen their pool!! Talent crunch-Corporate India forced to widen their pool!! The latest issue of Business World has an interesting article on how India Inc. is trying to overcome the the inability of the Education system to churn out the talent it requires-both quantity and quality!! There is an imperative need to learn from the American tradition of companies contributing to education with endowments and collaboration with universities in developing skills and intellectual property. 1.Some companies have resorted to setting up own education institutions. ICICI Bank has collaborated with NIIT to set up the Institute of Finance Banking & Insurance (IFBI). -to churn out about 100,000 trained professionals over the next three years. 2. Ernst & Young India, the Gurgaon-based arm of the global accounting and consulting major, has set up in-house academies for taxation and auditing skills in order to service its global clients from India. 3.Some IT companies are trying to spot talent to prepare potential recruits for prompt deployment by putting their software development tools in the hands of students and teachers in colleges. 5.Lowering the qualification bar is the way out for less skill-intensive jobs in relatively low-paying businesses,such as hospitality. With BPO, aviation and retail poaching hotels for polished youngsters, Delhi-based hotel company, Oberoi group of hotels, has experimented with hiring school passouts and sponsoring their graduation studies to enlarge its recruitment base. However what caught my eye –was the ‘catching them young’! !initiative by Infosys recently at Hyderabad. They invited a few hundred students –of Class VIII across some of the popular schools for a screening examination that involved some logical ability and IQ. About 20 of them –who have been shortlisted –would qualify to have 2 week training session at the company-followed by some exposure to ‘real life ‘ jobs! !